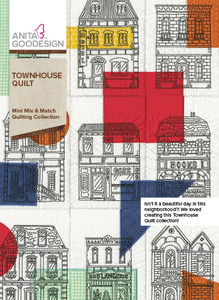 The Townhouse Quilt features modern quilt blocks with geometric shapes interspersed around the houses that, when stitched together, form large patterns. The townhouses themselves were designed with heavy running stitches and satin stitches combined, and are stitched in one color. This is a very quick quilt to create, and can be modern or traditional depending on the colors you choose. There are 20 different Mix & Match compatible designs included in this collection, and, like all of our quilting designs, each design comes in 5 sizes. 20 different designs in 5 sizes each (hoop sizes range from 5” x 7” to 9.5” x 14”).